Species differ strongly in their life histories, including the probability of survival. Annual adult survival was investigated extensively in the past, whereas juvenile survival, and especially survival to independence, received much less attention. Yet, they are critical for our understanding of population demography and life-history evolution. We investigated post-fledging survival to independence (i.e. 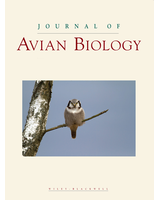 survival upon leaving the nest until nutritional independence) in 74 species of passerine birds worldwide based on 100 population level estimates extracted from published literature. Our comparative analyses revealed that survival to independence increased with the length of nestling period and relative fledging mass (ratio of fledging mass to adult body mass). At the same time, species with higher nest predation rates had shorter nestling periods and lower relative fledging mass. Thus, we identify an important trade-off in life history strategies: staying longer in the nest may improve post-fledging survival due to enhanced flight ability and sensory functions, but at the cost of a longer exposure to nest predators and increased mortality due to nest predation. Additionally, post-fledging survival to independence did not differ between species from the northern temperate zone vs species from the tropics and southern hemisphere. However, analyses of post-fledging survival curves suggest that 1) daily survival rates are not constant and improve quickly upon leaving the nest, and 2) species in the tropics and southern hemisphere have higher daily post-fledging survival rates than northern temperate species. Nevertheless, due to the accumulation of mortality risk during their much longer periods of post-fledging care, overall survival until independence is comparable across latitudes. Obtaining high-quality demographic data across latitudes to evaluate the generality of these findings and mechanisms underlying them should be a research priority.